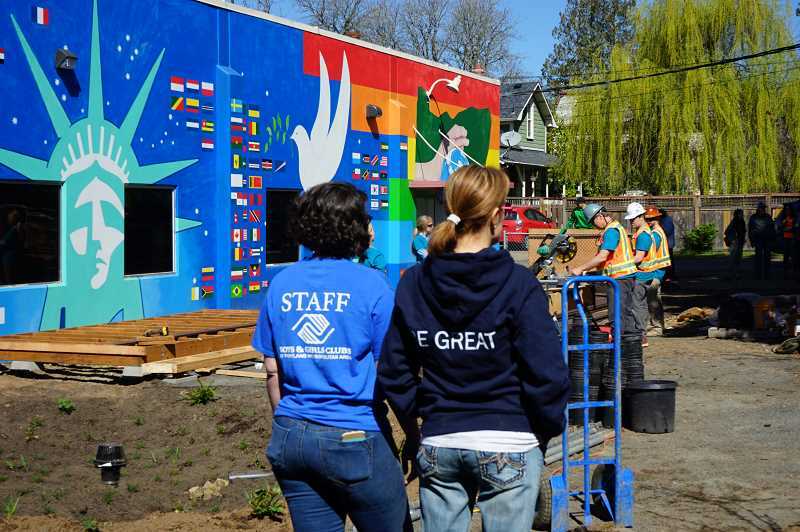 The Hillsboro Boys & Girls Club is getting a fresh makeover, and the public is invited to its grand opening on Friday, April 12. Inukai Family Club, 560 S.E. Third Ave., in Hillsboro, formally opens its new green playspace on Friday, offering children at the club a new, safe place to play outside. The Inukai Family Boys & Girls Club offers after-school and summer programs for children ages 6 through 18. Low income families and children of color make up about 80 percent of the club's students. The playground's grand opening from 4 to 7 p.m., Friday, April 12, will include a barbecue dinner, and ribbon cutting. The event is free and open to the public. Hillsboro Mayor Steve Callaway and muralist Arturo Villaseñor will speak at the event, as well as Ted Labbe, project manager at Depave. Want to attend? RSVP at depave.org/event/inukai-opening. to build the space. Volunteers removed asphalt in the center's courtyard during HillsDOer Day, a city-wide community service day. According to Boys & Girls Clubs, the new outdoor play space offers an "art-filled place to connect with nature, practice mindfulness, and play." "I couldn't possibly be more excited about this project, the impact it will have, and that we get to include our community and families in the process," Rachel Schutz, director of youth, family, and trauma-informed services at the Inukai Family Club said in October. "We at Inukai have been trying to get something done with that space for years now, and it means the world to me that Depave stepped in to make it happen. This project is critically needed to give our youth a safe, accessible, place to play in nature, something that has limited access at our club and surrounding neighborhood." The grand opening rounds off a week of nation-wide events recognizing the work of Boys & Girls Clubs.